Trace Software products are used to design, produce and control industrial installations. Software require considerable investment in terms of human resources. The average use rate can be several hours a day, and an unavailable program can raise many problems affecting both the company’s productivity and organization. That is why Trace Software is offering a specific subscription contract to support its customers throughout their use of the software in the company. To better meet their needs, Trace Software implements new services and offers its customers three levels of subscriptions Silver, Gold or Platinum to get the most out of their contract. The subscription contract guarantees peace of mind with a long-term customized follow-up. It optimizes the cost of ownership for your software. (1) Training webinars : 7 basic ones and 4 advanced ones per year. Access to recorded webinars. Subscription is the easiest way to keep your Trace Software International (TSI) design tools up to date. For an annual fee, you get the latest versions of your licensed TSI software, providing a budget-conscious way to ensure you are always using the most advanced technology. Automatic Software Upgrades – Receive all software upgrades and updates throughout the contract term. Lower Costs – Subscription customers get more and pay less. 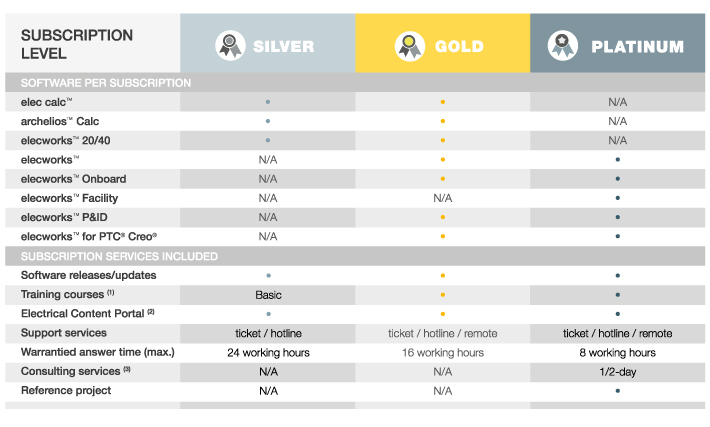 Upgrade pricing means that if you are not covered by subscription, upgrades are approx. 35% of the recommended price of the product you require. Over a 4 year period, subscription is lower than purchasing an upgrade every 2 years. Predictable Budgeting – Costs are known for the entire contract term whether 1, 2 or 3 years. Multi year subscription contracts provide the best protection against price increases. Product Service-Packs – Receive modular enhancements to various TSI software. Even after training, access to our technical department will provide the necessary reassurance when getting started with the software. Throughout your software use, some features are only very rarely used. When you encounter a new use case, a quick call to our technical department will save you precious time. How much does the subscription contract cost? The cost of the contract depends on the type of license. This subscription provides access to new services or benefits such as, for example, quarterly free training webinars, discounts on training or discounts on complementary products. The subscription should not be confused with the warranty. The warranty is valid for six months from the date of delivery and covers hidden defects preventing users from running the software. It does not offer any additional services, such as assistance or access to the manufacturer’s databases, or any obligation to provide versions with new added features. Whether you have suggestions for improving the current features or adding new functions, we ensure that our development plan takes account of our customers’ requests. Therefore, we invite you to give us your comments. Write to us now! We pay close attention to all requests, even simple suggestions for improving existing features. Trace Software is committed to upgrading your software by adding new features, optimizing processing capability, taking account of changes in the business, new processes and new operating systems… Tell us what your requirements are – a specific section is available on this site. Opting for the subscription also represents a contribution towards the financing of your software’s development. Despite the great deal of care that goes into designing and testing our software, there is a practically infinite number of ways in which our products can be used and there may consequently be errors. Such errors are corrected and the new versions are automatically made available to subscription customers. Software updates can be downloaded from this site. New OEM data and updates are also available for downloading by subscription customers. In practical terms, what does the contract comprise? The contract covers all the licenses used by the company. It is billed when the software is delivered. The contract is renewed by tacit agreement to avoid any interruption in service. For an extra cost to cover administration fees, customers may choose an express renewal option. Should the contract end for any reason whatsoever, it can be reactivated in return for the prior acquisition of an update for your licenses. When a new license is added to the contract, the initial contract term is maintained. The amount of maintenance corresponding to the addition of the new license to the contract is billed on a pro rata basis until the expiry date.